Unfortunately in this day and age, preventing red diesel theft and minimising the chances of being a victim of gas oil crime is a necessity. You don’t need to look too hard to find stories about thefts from farms, construction sites and similar locations where large quantities of red diesel and other fuels and oils and expensive machinery are stored. Before we look at some of the preventative measures you can take to hinder fuel thieves, it helps to understand why red diesel is targeted and why it is important to minimise the risk of being a victim. Why is Red Diesel Targeted by Thieves? Red diesel (gas oil) is used in off-road diesel-engined vehicles and machinery as fuel. Gas oil costs a lot less to buy than regular diesel (also known as road diesel or white diesel) because it is taxed at 5% rather than the higher duty applied to road fuel. It may, therefore, seem odd that thieves would steal a cheaper product and one that is used for off-road vehicles and machinery. However, red diesel users tend to buy their fuel in bulk which means thieves target storage units in the hope of finding a lot of fuel. It is also hard to purchase gas oil in large volumes without an RDCO number which is required when buying more than 99 litres of red diesel at any given time. This is taken when filling out the RDCO form which is required by all red diesel suppliers. 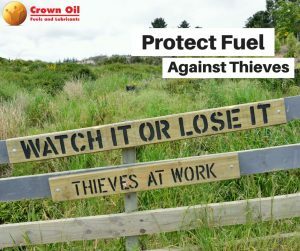 Thieves are finding filling stations harder and harder to steal worthwhile quantities of fuel from and therefore attack farms, building sites and homes that aren’t safeguarded against them. Another reason why fuel theft has risen over the years is possibly in relation to the rise in fuel prices. As the cost of diesel increases so does the chance of criminals targeting an exposed fuel tank. What can be Done to Stop Thieves from Stealing Your Diesel? Let There Be Light – Thieves tend to work best under the cover of darkness and have stolen from premises like yours before. Adding a spotlight near your tank of diesel fuel is a bright idea as it will shine some light on their audacious behaviour and hopefully have them running a mile. Who Let The Dogs Out? – Dogs have finely tuned senses, such as smell and taste, which usually gets them in to a bit of trouble for stealing things like chicken for your fine Sunday roast! They also have excellent hearing and can hear up to a quarter of a mile away. An alert dog can seriously put of red diesel thieves who make just the slightest of noise when trying to take your fuel without your permission! Don’t be alarmed – Well, only as the saying goes, you actually do want to be alarmed as this will certainly relieve any anxiety or worry of being a victim of fuel theft! There are a wide variety of fuel tank alarms which you can choose from. Even the cheapest should be enough to put off any would be fuel thief however, there are higher priced options which come with additional features. Position is everything – The position of your diesel fuel tank is important when deterring thieves. It needs to be positioned in the correct place to adhere to OFTEC guidelines however, you can position it so that it is well-hidden although this may create an area where potential thieves are covered. Other options may involve placing your fuel tank in a building our outbuilding which is lockable! Restricting access with a wall could be a good idea but please make sure that your fuel suppliers can access it too! I’m watching you! – CCTV (closed-circuit television) can be used as both a theft deterrent and means of catching thieves. Chances are they’ll hide their faces so make sure that it is well positioned and that would be thieves can see that you’re watching them. A hidden camera will not have the same effect to deter them but may help catch them although prevention is always better than cure. Other hidden cameras can be used to catch them whilst a real or dummy camera could be used as a deterrent. Lock, stock and no stolen barrels – Using a strong padlock will certainly deter a thief however, they do come equipped with cutters and other gizmos to help them steal your diesel. Make sure you invest in a robust lock and it could save you a fortune in time! You might want to try using several measures when preventing red diesel theft but, even if you choose just one method of theft prevention, it could drastically reduce the chances of becoming a victim. If you’d like more information about our range of Storage Tanks, call our friendly team on 0845 313 0845. They can also provide you with a Red Diesel quote to see how we compare to your current supplier.